The zebrafish (not to be confused with the invasive lionfish) has proven to be an excellent study subject because we share 71% of its genes. Like us – and unlike many other animals – this brightly colored fish, often found in home aquariums, is averse to the smell produced by rotting flesh. Researchers have identified the zebrafish's receptor for cadaverine and putrescine, the molecules given off by corpses as they decay. In studying the neural network of the fish, researchers from the University of Cologne, Germany, are puzzling out this evolutionary trait, which causes some animals to seek out carrion as food or a place to lay their eggs, but causes us to react strongly against being near bad meat. 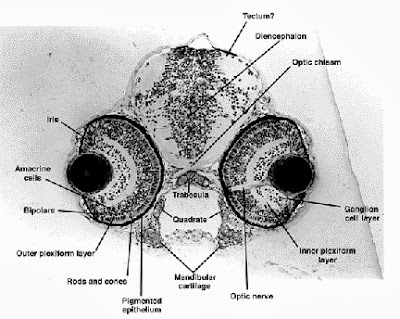 That may be only part of the reason the zebrafish (IMAGE OF EMBRYO ABOVE) swims away from the smell. Sigrun Korsching says, "It signals danger, if a dead body is lying around maybe the danger is still around. It could also signal that the meat is toxic and should not be eaten."